Last October I had the chance to read my work as part of the Fifth International Festival of Poetry in El Salvador. Although I had sent a number of poems to the Fundacion Poetas for translation, their translator managed to accomplish only one. When I arrived, I had only one poem which could be read on our tour (12 readings in 5 days!) 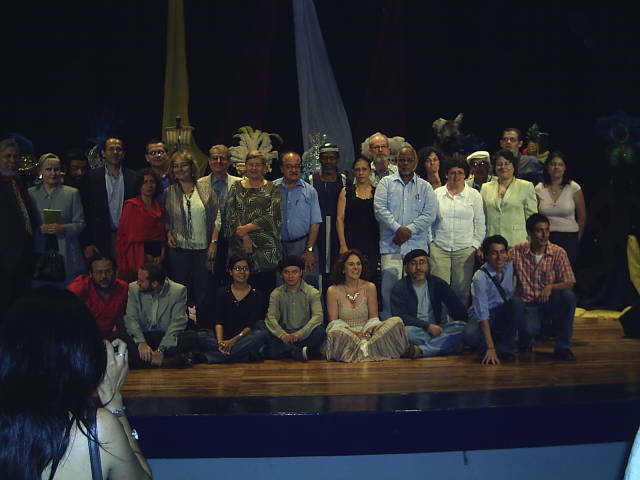 But I was surrounded by wonderful Latin American poets with whom I spent every waking hour (along with poets from France, Spain, Italy, Nigeria, and elsewhere) and this convivial bunch set out to remedy the problem. It was like a dream to be present while other poets, none of whom would settle for approximation or consent to lyrical, musical, or idiomatic collapse, worked on my poems, asking me questions from time to time, arguing with one another over nuance and emphasis. We worked in the hotel, in cafes, bouncing along over rutted roads in the back of a beat-up van. Here are the results, several of which are coming out in magazines in Mexico, Panama, Ecuador, Venezuela, and Costa Rica. de la palabra para la bienvenida. otra vez en otra parte. y con frecuencia escogen mal. la paz es un sueño. y se acerca con las noticias de cada día. las manos sangrantes de los soldados. y trae un cuadernillo y una calculadora. ¿En dónde crecerán los niños y las rosas? ¿En dónde nos haremos viejos? y más tranquilo como hijo. como para reparar la sed. querer estar en otra parte. ¿ Por qúe? preguntó Lázaro. ¿ Por qúe me devuelves? ¿ Estamos ahora en el tiempo de la Justicia? en la oscuridad, en la tierra. en una ciudad antigua de calles tortuosas. justo cuando íbamos a rendirnos. y primero lo encuentras, espérame allí. y si primero lo encuentro, esperaré por ti. Hey Richard:I was randomelly googling my name, and I found a link to a blogg which I hadnt seen nor knew about. I was surprised to see that the poem in which we worked on the translation, was there…as well as the group picture.Have you recieved any of my last two emails? I worked on the translation of the last poem you sent me on your last email, back in the late quarter of 2006, and emailed it to you, arround december or january. Neverthelless, I have not heard an news from you…not a word. I was getting worried, that something might have happened to you. How are you? changed emails?well hope to hear from you again, my email is still the same, although with some problems: andres.castro@gmail.com I think that my PC is the one with troubles.